» How fast do cells move? Cell movements are one of the signature features of the living world. Whether we observe the many and varied movements of microbes in a drop of water, the crawling of Dictyostelium cells to form fruiting bodies or the synchronized cell movements during gastrulation in the developing embryo, each of these processes paints a lively picture of cells in incessant motion. Fascination with cellular movements is as old as the microscope itself. In 1683, Leeuwenhoek wrote to the Royal Society about his observations with his primitive microscope (http://www.ucmp.berkeley.edu/history/leeuwenhoek.html) on the plaque between his own teeth, “a little white matter, which is as thick as if ’twere batter.” He repeated these observations on two ladies (probably his wife and daughter), and on two old men who had never cleaned their teeth in their lives. Looking at these samples with his microscope, Leeuwenhoek reported how in his own mouth: “I then most always saw, with great wonder, that in the said matter there were many very little living animalcules, very prettily a-moving. The biggest sort. . . had a very strong and swift motion, and shot through the water (or spittle) like a pike does through the water. The second sort. . . oft-times spun round like a top. . . and these were far more in number.” These excerpts beautifully illustrate both our attention to and wonder at the microscopic movement of cells. As noted by van Leeuwenhoek himself, there are many different types of cell movements. Many microorganisms (and larger organisms too!) make their way hither and yon by swimming as classically exemplified by E. coli and Paramecium. Another classic mechanism is the subject of one of the most famous series of time lapse images in all of biology where David Rogers captured the motion of a neutrophil crawling along a surface in hot pursuit of a bacterium. Yet another mode of bacterial motility is known as gliding and refers to a form of motion that is not yet fully understood. Of course, such cell movements are not at all the exclusive prerogative of single-celled organisms with all sorts of cell movements at the heart of developmental processes giving multicellular organisms their shape. One impressive example of such movements are revealed in the developing nervous system in which neurons undergo a kind of pathfinding where protrusions from certain neurons grow outward, say from the brain to the eye. Table 1: Cell speeds of different cells given in µm per time unit and as body lengths per time unit. Assuming bacterial length of ≈2 µm and eukaryotic cell length of ≈15 µm unless otherwise stated. Speeds depend on temperature, experimental conditions etc. Values given here are those reported in the literature. Most measurements are based on time lapse microscopy. One of the best ways to put all of these movements of cells of different scales in perspective is to evaluate how many body lengths a given organism moves every second. In swimmer Michael Phelps’ famous performances in several Olympics, he traveled 100 meters in roughly 50 seconds, meaning that he was moving at roughly 1 body length per second. The sailfish Istiophorus platypterus swims at a speed of roughly 110 km/h ≈ 30 m/s, corresponding in this case to roughly 15 body lengths per second. 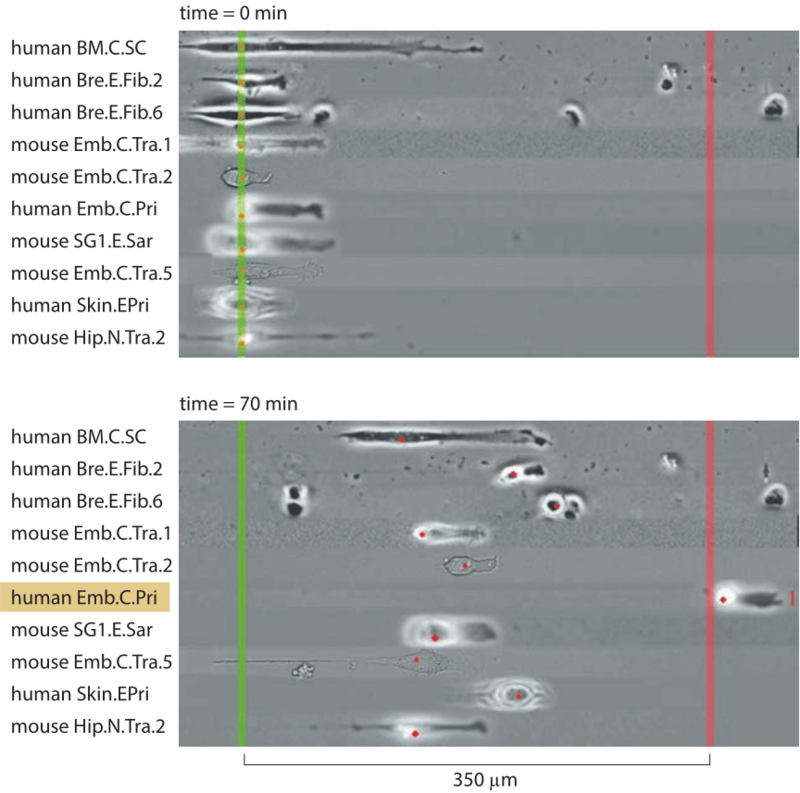 When undergoing its chemotactic wanderings, an E. coli cell has a mean speed of roughly 30 µm/s, meaning that it travels roughly 15 of its 2 µm body lengths every second. Similarly, amoeba such as Dictyostelium move at a rate of 10 µm/min or 1 body length per minute, very similar to the speeds seen in the motion of the neutrophil chasing down its prey as shown in the famed Rogers video. 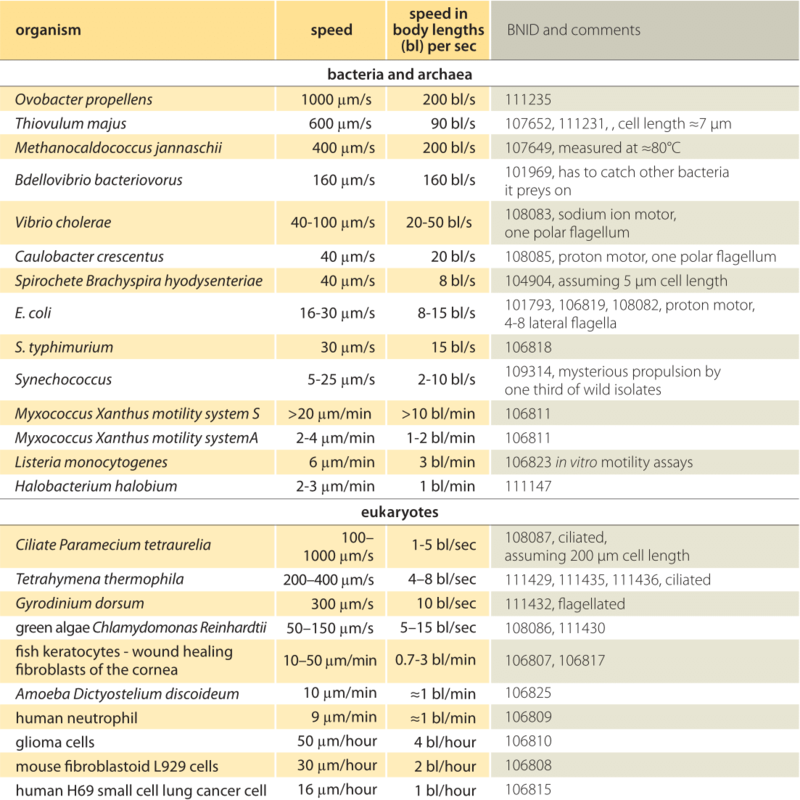 A collection of cell speeds is presented in Table 1. Taking the analogy of the Olympic race to a new level, a world cell race was recently performed that competed crawling cell lines from labs around the world on a race course made of micro-fabricated lanes. Figure 1 shows an overlay of the fastest cells in the competition. The winner was a human embryonic mesenchymal stem cell showing the fastest migration speed recorded at 5.2 μm/min. Comparison to Table 1 shows that this event, limited to crawling cell lines, is actually at a much slower pace than a possible microbial swimming event. What is the limit on the crawling speed of cells? Why should crawling be slower than swimming? The molecular basis is quite different as crawling is dependent on actin polymerization, whereas the swimming bacterium exploits flagellar rotation, for example. Actin polymerization based motility is key for the development of protrusions in polarized eukaryotic cells as well as for bacteria such as Listeria that move around inside cells by hijacking the host cell cytoskeleton. What can be said about the sources for the diversity in speeds? Some of the fastest bacteria are at high temperatures where rates of nearly everything tend to be higher or in organisms that have to depend on their speediness to make a living such as in the case of Bdellovibrio bacteriovorus that has to be faster than the bacteria it preys on. The record holder, Ovobacter propellens, moves at an astonishing 1 mm per second armed with about 400 flagella on the 5 µm cell (BNID 111233, 111232, 111235). The pressure to run swiftly is less clear. The functional significance of different swimming speeds for bacteria is usually discussed in terms of the ability of bacteria to achieve chemotaxis where they perform a biased random walk using their flagella to environments of higher nutrient concentrations. Different lines of evidence suggest that motility might have important parts to play in the dense communities of bacteria where the survival and growth often depend on more intricate issues of communication, cooperation and relative location, all affected by motility.